We, as cyclists, know the rules of the road and how to ride a bike, right? Yes, but do we know how to be safe in all traffic situations and conditions? Not necessarily. The Please Be Kind to Cyclists organization has created a common sense approach to ensuring that all cyclists stay safe on the road. By implementing the Cyclist VIP program along with the rules of the road, we feel that lives will be saved and a better community will be achieved. What does VIP stand for? Wear a bright colored helmet or paint it with bright paint. Avoid wearing dark clothing when riding in the dark. Use lights, and if possible turn them on at all times. A flashing light sends a cue to a driver’s brain that there is a cyclist near them and chances are he or she will have enough time to react. Position yourself on a safe place on the road. Take the entire lane when necessary. Look around you at all times, learn to scan on both sides. Practice turning your head to either side in a safe and secure area so that you know how to continue to control your bicycle while doing so. Use common sense. Determine whether taking the lane is the safe thing to do. Sometimes the sidewalk or a different route is your best and safest choice. Remember, it can take up to 25 feet to stop, depending on your speed. Especially when you are going down a hill, or even on a street with a small slope; you will not be able to stop like a car can. Learn alternate routes. Taking streets that are wider or have less traffic can make an extended route a safer and more efficient choice. Cyclists do have the right to travel alongside motorists in most cases, but that does not always make it the best choice. By following the rules of the road you are helping make yourself predictable to those around you. 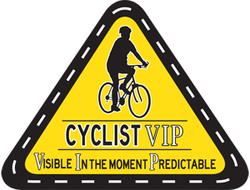 Following the Cyclist VIP increases your level of predictability. Observe the road, drivers, and weather conditions. Remember, the morning or afternoon sun can blind you as well as drivers. Most crashes can be avoided if we ride our bikes defensively. Anticipate drivers’ next moves, especially in driveways and intersection crossings (while on the road or sidewalk). For Cyclist VIP printed information, please contact us!